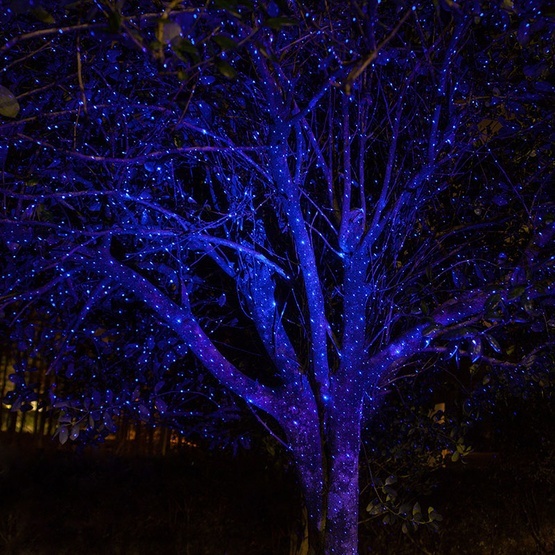 Blue lights are one of the most popular color options for Christmas decorating and a wonderful way to accent your backyard parties and events too. Blue C7 and C9 bulbs and mini lights are a traditional option for creating a winter wonderland in December, however blue mini lights and fairy lights are also very popular for use in table and floral decorations year round. A19, S14 & G20 bulbs are larger style blue bulbs and are perfect for illuminating a summer patio with a tranquil glow. Looking to cover a large space with blue lights? Consider using blue LED bulbs and string lights to cut power costs and lessen the potential of blowing fuses. LED lights last longer than incandescent, use up to 90% less energy and allow multiple sets to be connected through one power source, making them an excellent option for larger lighting projects. 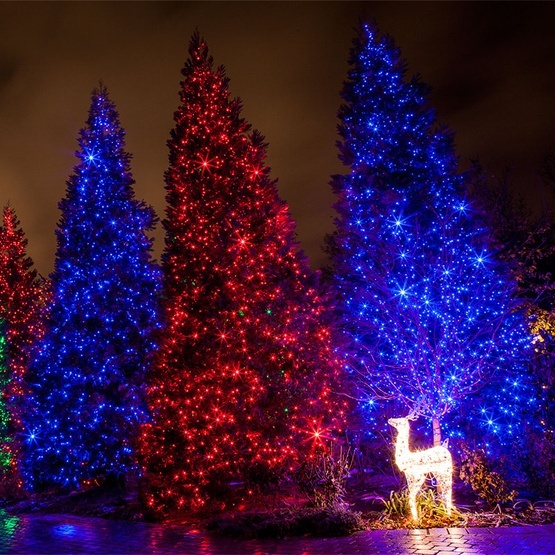 As one of the most popular colors for Christmas decorating, blue lights are often combined with complementary colors to create festive themes. Blue and white themed light strings are a popular choice as Christmas roof lights and walkway lighting for a dramatic ice-like glow and are also used in decorating for Chanukah celebrations. Blue and green Christmas lights are another popular combination. To create an eye catching display in your front yard, cover your bushes in blue net lights, hang blue/green combination icicle lights across the roof and wrap your trees with blue and green LED mini lights. When you combine the brilliance of blue with a vibrant accent color, the result is a dramatic and fun light display guaranteed to turn heads! 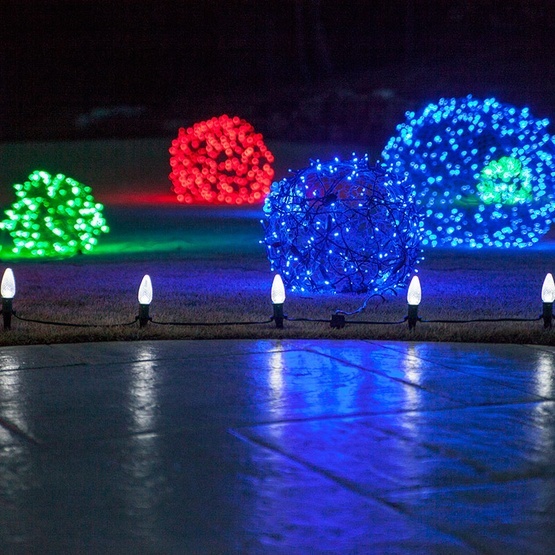 There are so many great ways to decorate indoor and outdoor spaces with blue Christmas lights and decorations. Try one of our ideas below to add a pop of blue to your holiday displays and consider going bold by including a complementary color, like green or white to your blue themed Christmas decorations. Wrap a flocked white Christmas tree with blue mini lights. 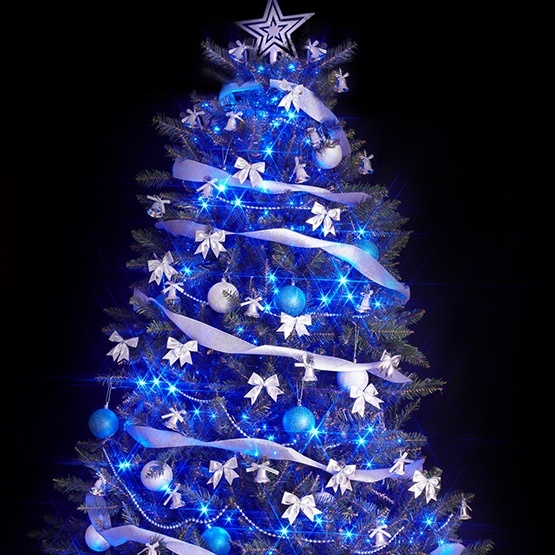 Decorate green Christmas trees and wreaths with blue lights and silver or white ornaments. Hang a combination of blue snowflakes, moravian stars and starlight spheres from tree branches. 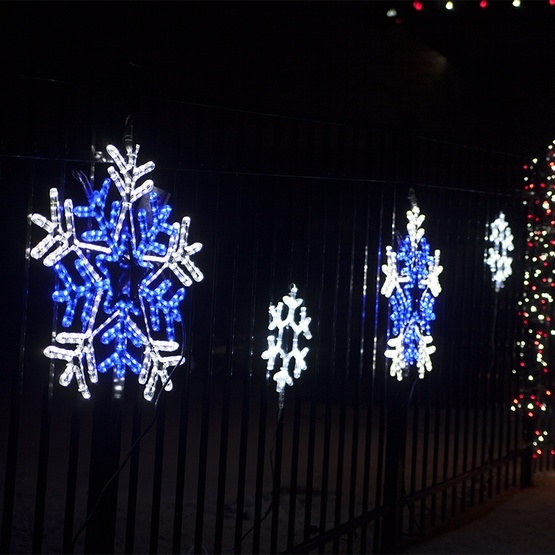 Create a wintry mix across the front porch or gates with blue snowflakes and star motifs. Place large blue spheres in various places throughout your yard for use as ornaments. Shine laser lights on the front of your home or against trees. Transition your parties from day to night with blue outdoor lights! Blue string lights and party lights can be combined with other colors to illuminate a sporting event in your favorite team colors or brighten a backyard bash on Fourth of July and Memorial Day. Sport your team colors by alternating blue party bulbs with red, orange, white or green bulbs above outdoor events or wrap porch railings and illuminate a poolside bar with blue combination mini lights.